Jerry Pelham is the king of auto salvage. There may be no man in Tennessee who has bought more wrecked or junked vehicles than Woodbury's Jerry Pelham. Ask the Auto Salvage King of the Midsouth how many cars and trucks he has purchased over the past half century and he cannot hazard a guess. "I have no idea. A lot of 'em," says the laidback fellow, 68, who opened Pelham's Auto Salvage in 1958 when he was a lad of 14. It would not be a fantastic notion to reckon the grand total of his vehicles might stretch bumper to bumper from Woodbury to Detroit and back again. Pelham's motor madness and business brilliance began with a junker '49 Ford that he bought way back when for $40. "It was rusted out and didn't run too good," said the salvage man of his modest beginnings, who these days drives a 2005 Chevy pick-up. "I bought it wrecked and fixed it. I don't buy no new ones." Pelham has seen a sea of change in the salvage and automotive industry over the past seven decades. "Used to be everybody worked on their cars. You'd change engines in your driveway or go see a shade tree mechanic. Now you gotta take them to where they use a computer to check 'em. When I started we'd just check fire and gas, but today there are sensors on everything," says the the Woodbury Lions Club member. Pelham, an old dog in the salvage world and as congenial a gent you'll ever meet, has learned a few new tricks. Besides buying clunkers that folks tote, tow or push on to his property, he purchases cars over the Internet. And he's adding a new attraction to his business come early November with a "you-pull-it" lot. "I buy so many cars. These cars we're gonna drain the oil and put 'em up on rims. They'll be new models and old models. We'll charge a $2 fee to go in. You can just go out there and get what you want and come in and pay. Be real cheap prices. "We'll start with 400 to 500 cars. I think the lot will hold a thousand cars, and we'll rotate 'em out and put fresh ones in," said the man who grew up a half mile away from his salvage lot, 3½ miles south of Woodbury on Highway 53. The eldest of six children born to Noah and Alice (Phillips) Pelham, Jerry learned from his mechanically-minded father who worked on "appliances and TVs and whatever." He ventured into the salvage and scrap business when he was 14 on March 13, 1958, when he bought his original business license for three bucks. "My dad bought aluminum and copper, and I started junking cars and selling the parts," recollected Pelham, who moved his business to its present location in 1976. Here on about 20 acres, he keeps a thousand cars, more or less, almost all of them purchased from individuals or at insurance auto auctions. Currently, he's been buying cars that no longer run for $11 per 100 pounds and hulls for $10 per 100 pounds. He said that averages between $350 to $500 per car depending on the weight of the vehicle. Eddie Taylor, now retired, was Pelham's first employee, and worked the parts counter for 24 years. "We didn't have no computer. We hand writ all the tickets. We knew where everything was. Cars were simpler," said Pelham of past decades. "They would ask me and Eddie, 'Have you got this?' and we could go and get it, but now we got computers." 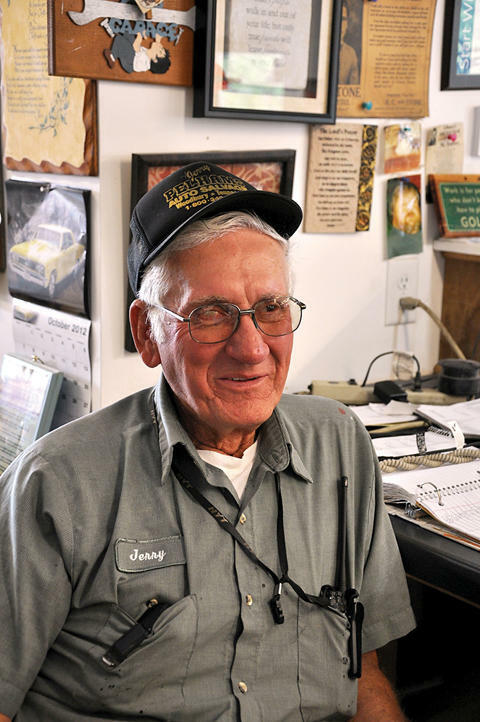 Pelham's Auto Salvage employs 10 including four members of Jerry's family. His son Terry has been disassembling cars "ever since he was big enough to walk." Wife Joyce handled the bookkeeping for years, a chore now taken by daughters Angie (Rogers) and Amy (Bogle). And son-in-law Richard Bogle operates the wrecker service. Pelham's best sellers include engines, transmissions, door glass, alternators and starters. "We probably got about 500 motors and 600 transmissions," he estimates, and they're all neatly labeled and stored in sheds. Besides selling auto parts, Pelham's Auto Salvage recycles scrap metal and aluminum cans and offers 24-hour wrecker service. Customers looking for parts phone in from across the United States. "We had one guy in Chicago who called and said he saw one of my [ball] caps and the 1-800 number. We've got ads in these locator magazines, and I have 'em call from these magazines, and we have a Web site," said Pelham about the ways he promotes his business. But he's not a man who enjoys sitting behind a counter hours at a time. He comes to work early and leaves late, and from three to five hours a day, he operates a front-end loader, a labor of love. The best part of running this business, he says, "I guess dealing with the people. I have guys come in here and get something and they say, 'I remember coming in here with my dad.' I had one guy who said he remembered when he was young and had a '57 Chevy and came here to get a front end for it, and it cost him $150. And I remember when my dad and I did a car overhaul and charged $65. "Cars, man, they've changed. Used to be you'd hit a tree and hardly bend it. Today you hit one and it totals it. They're just throwaways. They just scrap 'em and go buy something else," says the man who battled tonsil cancer in 2006 and 38 radiation treatments later came out with a clean bill of health. Ironically, this country gentleman, who can retrieve practically any car part you're searching for, has had no luck in finding the truck of his dreams. Says Pelham, "I been looking for a '58 Chevy pick-up that I could repair because that's the year I started." The Auto Salvage King is still searching.